Goa has talent bursting at its seams and this is no secret. Unfortunately, in the sphere of drama enough of it has not been tapped. The reason for this is not a dearth of avenues, but rather the unwillingness of parents to permit their children to explore this area as a career option has been a stumbling block. In 1987, Kala Academy decided to start the School of Drama, initially called the Theatre Art Faculty, under the direction of S B Josalkar. The motivation was to secure talent in theatre and mould it according to its capabilities. 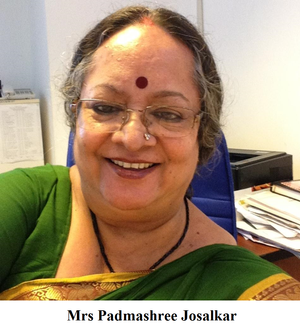 The Director Mrs Padmashree Josalkar tells us, ‘Kala Academy invited my husband and me to come here. Before that we were in Delhi. My husband was in the Repertory Company of the National School of Drama and I was teaching at the Sardar Patel Vidyalaya as a drama teacher.’ S B Josalkar, a Goan by birth, had received a scholarship to the National School of Drama. It is no surprise then that he returned to his home state to give Goan theatre a shot in the arm. The three year diploma course (Diploma in Dramatics) is open to any student who has passed his or her HSSCE. ‘Every year the intake capacity is 15 students but we never get that many,’ says Mrs Josalkar, a graduate of the National School of Drama herself. The curriculum includes dramatic literature, theatre techniques, acting, participation and production. Dramatic literature further consists of classical Indian drama, modern Indian drama and world drama. In acting, the students have to learn yoga, dance, theatre music, mime, improvisation, role analysis, voice and speech, and acting theory. Theatre techniques comprise of costume designing, set designing, stage lighting, theatre architecture, carpentry and make-up. 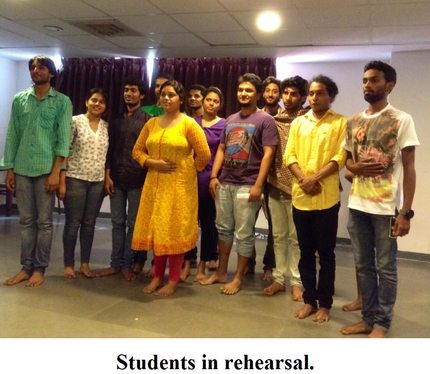 There is a one year Certificate Course in Dramatics, which comprises the same curriculum prescribed for the students of the first year of the diploma course. The diploma course, however, requires students to concentrate on acting or production during their second and third year of study. Apart from these areas of study students must perform in and produce plays. ‘Our syllabus is designed in such a way that more prominence is given to performing. Apart from literature all the other subjects are practical work,’ informs Mrs Josalkar. Students have to obtain high marks in dramatic literature in order to opt for specialisation in production. Here the concentration would be on literature and theatre techniques. Those who choose acting will focus on literature as well but without theatre techniques. ‘Only in the 1988 we had four students who opted for production and the next year also there were four students. Since then all the students choose acting over production,’ says Mrs Josalkar. Two examinations are held in a year. In the first year the examinations are generally theory based. During the next two years examinations involve more practical work and literature subjects have project discussions. Only the acting theory retains a written examination through the second and third year. Every drama that they take on has its own challenges. It is the rehearsals that are held that allow the students to comprehend the play as it should be. The students are expected to master the languages in which the plays are performed. These languages would be Hindi, Marathi and Konkani. More recently the students have also performed plays in English. Though the course does not offer placements, it does provide a repertory company where the graduates can work as B grade artists with salaries. The rest have to make their own way in their careers. Despite this lack of job assurance, the School of Drama has many famous alumni, such as international award winning filmmaker Laxmikant Shetgaonkar (Paltadacho Munis), Saish Deshpande at All India Radio, Dnyanesh Moghe, Satish Gawas and Kevin D’Mello. Third year student Gautam Anand Gaude, who has participated in amateur theatre as a student of science in high school, says, ‘You realise that you have a lot more to learn when you come here. You get to learn techniques that amateur theatre doesn’t teach you.’ Gautam joined the course after a physics laboratory assistant derided drama as a profession. He wanted to prove that he could have job satisfaction as well as earn a livelihood through theatre. This June, the diploma course, which is graced with the guidance of a reputed visiting faculty, may be converted to a degree course by becoming affiliated to Goa University and the All India Council for Technical Education. The School of Drama will be available at two levels, as a community college and as an institution affiliated to Goa University. This will give the course the stature it deserves throughout India.